Leading researchers and medical health professionals have raised their concern about the over all declining status of health and well being world wide. A rising trend in childhood obesity, cardiovascular diseases, clinical depression syndrome in young adults is reason enough to try and broaden the scope of plausible agents which result in people making bad health decisions. As a witness to the emerging dietary trends adopted by children and young adults, it is natural to question the ethics of processed food and beverages industry. Does it seem reasonable the 2L bottles of soda cost $2 USD? There are more people claiming to not like water since it is flavorless. 100% fresh juices are subject to scrutiny for their lack of adequate fiber content and excess presence of sugars. Products with high fructose corn syrups, added preservatives in processed meat, ‘read to eat’ meals are agreeably cost effective and saves a lot of time, however the over riding damage is in the long run with deficient immune system and gain of unnatural toxins which the body finds hard to eliminate. Another marketing frenzy is visible in the neutraceuticals range of instant energy drinks, protein shakes and over the counter pills. The focus is towards having the visibly attractive, muscular body regardless of the compromised health. The companies do their bit of limiting the usage by adding a precaution statement and dosage remarks on the product labels. This is however not translated as useful information to the young consumers who do not foresee the detrimental outcomes in advance. As the prices of insurance packages and medical aid is negotiated, the same effort needs invested in the regulation of consumer dietary products. We do not want a ban on Colas however, we do not also need them to be sold at prices cheaper than water. Fresh fruits and vegetables need not be price tagged astronomically driving population to adopt a risk driven lifestyle. Taking initiatives to promote urban farming and local gardens, reaching out to the people about their choices and how it impacts the global financial predicament is a need of the hour. We are ok with the attitude of “Don’t tell me how to live my life” in a world relying heavily on subsidized medicines. This has to change. Subsidized medicine is a privilege and should be benefited to those responsible. Researchers and big pharma companies are not the only stake holders in this fight against an exponentially growing illness of misinformed decisions. People need to be brought in and educated. This includes strong arming anyone who feels they have a right to abuse their health or the health of the world. Another paradigm to this discussion is the need for more extensive research hubs world wide and making the accessibility of advanced medicines available to the dense population regions in Asia, Africa and Middle East Arab countries which host the majority of the population and have the least of the resources. We need 100 Massachusetts world wide with cutting edge researchers deep diving and venture capitalists backing them up. A vision for 2050 must encompass every individual being aware of what it takes to damage a human body which is a very robust machine. Eating right and being able to afford health must not be difficult. Choices available in the stores must be rational to the level where the most ignorant of the lot is still consuming risk free substances. Given the fantastic evolutionary armaments we have, it takes a lot to be unwell and yet we seem to making it fairly easy to catch cold. Healthy people translate to healthy economy. European researchers have designed a “giant” molecule formed by thirteen fullerenes covered by carbohydrates which, by blocking this receptor, are able to inhibit the cell infection by an artificial ebola virus model. Different studies have demonstrated that the ebola virus infection process starts when the virus reaches the cellular DC-SIGN receptor to infect the dendritic cells (of the immune system). In this study researchers from the Universidad Complutense de Madrid/IMDEA-Nanociencia, the Instituto de Investigación Sanitaria Hospital 12 de Octubre (Madrid), and the Instituto de Investigaciones Químicas del CSIC-Universidad de Sevilla have collaborated, together with three european research groups (CNRS/Université de Strasbourg, France and Université de Namur, Belgium). “Fullerenes are hollow cages exclusively formed by carbon atoms”, explains Nazario Martín, Professor of Organic Chemistry in the UCM and main author of the study. In this work, scientists have employed C60 fullerene, which is formed by 60 carbon atoms and has the shape of a truncated icosahedron, which resembles a football ball. These molecules decorated with specific carbohydrates (sugars) present affinity by the receptor used as an entry point to infect the cell and act blocking it, thus inhibiting the infection. 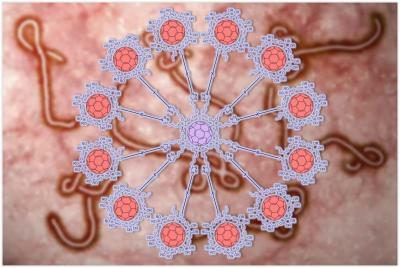 Researchers employed an artificial ebola virus by expressing one of its proteins, envelope protein GP1, responsible of its entry in the cells. In a model in vitro, this protein is covering a false virus, which is able of cell infection but not of replication. “We have employed a cell model previously described in our lab which consists in a cell line of human lymphocytes expressing DC-SIGN receptor, which facilitates the entry of the virus in Dendritic Cells”, points out Rafael Delgado, researcher of the Hospital 12 de Octubre, and other of the authors of the study. By blocking this receptor and inhibiting the virus infection, the authors think that the dissemination of the virus would decrease and the immune response increase, but this idea has still to be developed with in vivo studies. The system designed by the chemists, based on carbon nanostructures developed in the UCM, mimic the presentation of carbohydrates surrounding virus like ebola or VIH. The team has achieved an unprecedented success in fullerene chemistry and dendritic growth: connecting in one synthetic step twelve fullerene units, each with ten sugars, to other central fullerene, creating a globular superstructure with 120 sugar moieties on its surface, “this is the fastest dendrimeric growth developed in a laboratory up to now” says Beatriz Illescas, Professor in the UCM and coauthor of the work. According to scientists, the results highlight the potential of these giant molecules as antiviral agents. “This work open the door to the design and preparation of new systems to inhibit the pathogens infection in cases where the current therapies are not effective or are inexistent, as occurs with the ebola virus”, clarifies Martín. After these experiments on the cellular level, researchers will study the behavior of these systems in animal models, starting with mice. “We will study, on the one hand, the pharmacokinetics and, on the other, the antiviral activity in vivo” explains Javier Rojo, researcher of the Instituto de Investigaciones Químicas del CSIC and other of the authors of the study. Once the most effective compound has been identified, studies using the true ebola virus could be carried out. DC–SIGN, which is abundantly expressed by DC both in vitro and in vivo, … Whereas ICAM-3 binding by monocytes is for the greater part LFA-1 … The specificity of this adhesion receptor on DC for ICAM-3 is demonstrated by the …. This subset coexpresses CD14, CD16, and CD33 and is thus of myeloid origin. In contrast to. CD14 monocytes, DC–SIGN blood cells. Jul 14, 2006 … Although B cells that express DC–SIGN do not replicate HIV-1, they serve as … receptors [12–15], with conflicting reports on expression of DC–SIGN[16,17]. ….. Results. The effect of human milk on direct HIV-1 infection of CD4+ T lymphocytes … expressing the DC–SIGN receptor (Raji-DC–SIGN) (8). “The most egregious failure was by WHO in the delay in sounding the alarm,” said Harvard’s Ashish Jha. An independent group of 19 international experts, convened by theHarvard Global Health Institute and the London School of Hygiene and Tropical Medicine (LSHTM), today issued a scathing analysis of the global response to the 2014-15 Ebola outbreak in West Africa. The report, published in the prestigious British medical journal The Lancet, is especially hard on the World Health Organization (WHO), which the panel contends failed to provide the leadership and support needed to deal properly with the outbreak of hemorrhagic fever that infected more than 28,000 people and claimed more than 11,000 lives. “The most egregious failure was by WHO in the delay in sounding the alarm,” said Ashish Jha, director of the Harvard Global Health Institute, K.T. Li Professor of International Health at the Harvard T.H. Chan School of Public Health, and a professor of medicine at Harvard Medical School. “People at WHO were aware that there was an Ebola outbreak that was getting out of control by spring … and it took until August to declare a public health emergency … Those were precious months,” said Jha. The global response to Ebola is being examined by a number of different panels, Jha said, including a group at WHO and another at the United Nations. During the height of the epidemic in fall, 2014, Jha met with Julio Frenk, then the dean of the Harvard Chan School, and Suerie Moon, research director and co-chair of the Harvard Kennedy School’s Forum on Global Governance for Health, and a Harvard Chan faculty member. Together, they “decided this deserves independent examination; we can’t let this happen again,” Jha said. “The Ebola outbreak is a stark reminder of the fragility of health security in an interdependent word,” the report reads, “and of the importance of building a more robust global system to protect all people from such risks. Though it pulls no punches in its criticism of the ways institutions and nations responded to the Ebola crisis, the Harvard-LSHTM report is also a positive document, offering 10 concrete recommendations to strengthen public health systems and future responses. One recommendation is that WHO create a dedicated center “for outbreak response, with strong technical capacity, protected budget, and clear lines of accountability,” and that that center be governed by a separate board independent of the WHO bureaucracy. “Our primary goal is to convince the high-level political leaders, north and south, to seize the moment to make necessary and enduring changes to better prepare for future outbreaks, while memories of the human health costs of inaction remain vivid and fresh,” the report said. Ebola—lessons learned: Authors from Harvard’s Global Health Institute and the London School of Hygiene and Tropical Medicine outline 10 proposals to help prevent future health catastrophes, based on experiences from the 2014-15 Ebola outbreak in west Africa. The current outbreak of Ebola in west Africa is both a public health emergency of international concern and a human tragedy. The Lancet Ebola Resource Centre contains all related resources from The Lancet family of journals offered with free access to assist health workers and researchers in their important work to bring this outbreak to a close a quickly as possible. Find out more about Ebola in The Lancet’s Seminar. Criticism of WHO’s response to the west African Ebola crisis spawned an expert review that this week proposed several solutions to restore the agency’s performance. John Maurice reports. WHO suffers from an incapacity “to deliver a full emergency public health response” against a severe epidemic. So concluded a panel of six international health experts in a damning report released on July 7. They prescribed 21 actions aimed at restoring WHO’s “pre-eminence as the guardian of global public health”. The panel was commissioned by WHO Director-General Margaret Chan in response to widespread criticism that WHO had mishandled its response to the west African Ebola epidemic. The panel corroborated many of the criticisms. Chief among them was the “unjustifiable” time it took WHO to declare the outbreak a “public health emergency of international concern”. Chan made this declaration 5 months after the escalating spread of Ebola had become evident. WHO officials claim that the delay in making the official declaration did not affect its operations involving some 100 staff in the field in the early months of the epidemic. WHO’s Member States also drew sharp criticism from the panel. Many applied travel bans during the epidemic without WHO authorisation, thereby contravening the International Health Regulations (IHR) and “causing negative political, economic and social consequences for the affected countries”. Perhaps the most damning criticism of WHO came from Médecins sans Frontières (MSF), whose teams were among the first to arrive at the scene of the outbreak in March, 2014. An MSF reportpublished in March, 2015, describes how MSF was unable to convince WHO that the epidemic was out of control. “WHO officials”, the report notes, “called us alarmists”. Four of the panel’s recommendations stand out: countries should be given incentives to comply with the IHR and disincentives, such as sanctions, when they flout them; a brand-new WHO Centre for Emergency Preparedness and Response should be created; a contingency fund of US$100 million to be used solely to finance outbreak responses should be established; and an intermediate trigger should be set up to alert the health community to a health crisis before it becomes an emergency. David Heymann, head and senior fellow at the Centre on Global Health Security in Chatham House, London, wonders whether the panel’s recommendations for fundamental changes in the decision-making processes can be implemented. “WHO has a flawed structure and I’m not sure its Member States have the will to change that.” He commends the panel’s call for strengthening existing emergency response mechanisms, such as the Global Outbreak Alert and Response Network (GOARN). “This is an agile, sustainable network of epidemiologists, logisticians, and other field-support experts from WHO Member States. It goes immediately into action to prevent outbreaks from becoming emergencies of international concern and has worked extremely well in previous Ebola outbreaks and in the 2003 SARS epidemic.” He believes that the existence of GOARN, with an added external advisory group, obviates the need for the new WHO emergency response centre proposed by the panel. Experts were unanimous on one point made in the report. With 20–30 cases occurring every week, Ebola in west Africa is not over and many eyes are now on WHO’s role in ending it. “WHO must reestablish its pre-eminence as the guardian of global public health.” These words resonate throughout the final report of the Ebola Interim Assessment Panel, requested by WHO’s Executive Board, chaired by Dame Barbara Stocking, and published this week. The findings of the panel present a devastating critique of WHO and the chronic inaction of its member states, which together created the conditions for an Ebola virus disease outbreak of unprecedented ferocity and human tragedy. The Stocking Report, as it will come to be known, sets out in agonising detail how the entire global health system fatally let down the people of west Africa. Stocking reserves her harshest criticism for WHO. The delays in announcing a Public Health Emergency of International Concern (it took 5 months from announcing an “unprecedented outbreak” in April, 2014, to declaring a public health emergency on August 8) was “unjustifiable”. The agency’s culture is unfit to manage an emergency response. Independent and courageous decision-making by the Director-General of WHO and her team “was absent in the early months of the Ebola crisis”. The agency was slow and reactive to events. WHO has lost its position as the authoritative body on health emergencies. It thought it could manage Ebola through polite behind-the-scenes international diplomacy. It failed to recognise that Ebola was a health emergency, not a diplomatic puzzle. And WHO’s communication strategy for Ebola simply “failed”. The agency failed to communicate proactively and it failed to establish itself as the authoritative voice on the Ebola outbreak. Member States of WHO are not spared. They have persistently failed to take the International Health Regulations (IHR, 2005) seriously—a position that is “irresponsible” and “untenable” for global health security. They should adopt the notion of “shared sovereignty”. They need to invest in WHO (the Panel proposes a modest 5% increase in assessed contributions in 2016). The Panel’s recommendations are clear and forthright. Although WHO was severely criticised, Stocking argues that the agency should still take the lead for emergency health responses. But to do so, WHO must undergo “significant transformation”—not least, adequate funding and a change in culture. It must provide costed plans for establishing core public health capacities as set out in the IHR (2005). It should establish a new WHO Centre for Emergency Preparedness and Response, with an independent board that publishes a report on Global Health Security annually. WHO country and regional offices should be strengthened. The agency should take its role in accelerating the research and development of diagnostics, vaccines, and medicines more seriously. And WHO should do more to coordinate its activities with other parts of the humanitarian community. The IHR Review Committee should examine the value of an intermediate alert for a public health emergency, lowering the threshold at which the world can be warned of a new health risk. And sanctions against countries that violate the IHR should be considered. The Panel makes clear that global health must be put at the centre of the global security agenda. But while its recommendations are cogent, there are three important omissions that deserve attention. First, the Panel does not address the vicious cycle within which WHO is caught. The reason why WHO is so poorly resourced is that it lacks the confidence of donors. As the agency continues to underperform because of chronic underinvestment, so that lack of confidence (and the resultant unwillingness to invest) only worsens. The Panel presents no way out of this endless circle of failure. Second, one of the most important responsibilities for governments is the preservation of public order and national security. In the context of Ebola (indeed, any health crisis), this means creating resilient health systems to protect populations from unexpected shocks, as explained by Mosoka Fallah and colleagues in a letter from Liberia’s Ministry of Health this week. Universal health coverage should have been emphasised as a crucial instrument in building global health security. Finally, the Panel rightly notes that, “While WHO has already accepted the need for transformation of its organisational culture and delivery, it will need to be held accountable to ensure that this transformation is achieved”. However, nowhere does the Panel recommend the accountability mechanism to monitor and review the implementation of its recommendations. Our fear is that the unique opportunity presented by the Stocking Report will be squandered. We have little confidence that the governing bodies of WHO will deliver on the expectations of Stocking and her team. The responsibility for action therefore falls to WHO’s Director-General. Dr Margaret Chan has 20 months to save her agency from further and possibly irreversible reputational damage. Mara Jana Broadhurst, John Daniel Kelly, Ann Miller, Amanda Semper, Daniel Bailey, et al. Background At present, diagnosis of Ebola virus disease requires transport of venepuncture blood to field biocontainment laboratories for testing by real-time RT-PCR, resulting in delays that complicate patient care and infection control efforts. Therefore, an urgent need exists for a point-of-care rapid diagnostic test for this disease. In this Article, we report the results of a field validation of the Corgenix ReEBOV Antigen Rapid Test kit. Methods We performed the rapid diagnostic test on fingerstick blood samples from 106 individuals with suspected Ebola virus disease presenting at two clinical centres in Sierra Leone. Adults and children who were able to provide verbal consent or assent were included; we excluded patients with haemodynamic instability and those who were unable to cooperate with fingerstick or venous blood draw. Two independent readers scored each rapid diagnostic test, with any disagreements resolved by a third. We compared point-of-care rapid diagnostic test results with clinical real-time RT-PCR results (RealStar Filovirus Screen RT-PCR kit 1·0; altona Diagnostics GmbH, Hamburg, Germany) for venepuncture plasma samples tested in a Public Health England field reference laboratory (Port Loko, Sierra Leone). Separately, we performed the rapid diagnostic test (on whole blood) and real-time RT-PCR (on plasma) on 284 specimens in the reference laboratory, which were submitted to the laboratory for testing from many clinical sites in Sierra Leone, including our two clinical centres. Findings In point-of-care testing, all 28 patients who tested positive for Ebola virus disease by RT-PCR were also positive by fingerstick rapid diagnostic test (sensitivity 100% [95% CI 87·7–100]), and 71 of 77 patients who tested negative by RT-PCR were also negative by the rapid diagnostic test (specificity 92·2% [95% CI 83·8–97·1]). In laboratory testing, all 45 specimens that tested positive by RT-PCR were also positive by the rapid diagnostic test (sensitivity 100% [95% CI 92·1–100]), and 214 of 232 specimens that tested negative by RT-PCR were also negative by the rapid diagnostic test (specificity 92·2% [88·0–95·3]). The two independent readers agreed about 95·2% of point-of-care and 98·6% of reference laboratory rapid diagnostic test results. Cycle threshold values ranged from 15·9 to 26·3 (mean 22·6 [SD 2·6]) for the PCR-positive point-of-care cohort and from 17·5 to 26·3 (mean 21·5 [2·7]) for the reference laboratory cohort. Six of 16 banked plasma samples from rapid diagnostic test-positive and altona-negative patients were positive by an alternative real-time RT-PCR assay (the Trombley assay); three (17%) of 18 samples from individuals who were negative by both the rapid diagnostic test and altona test were also positive by Trombley. Interpretation The ReEBOV rapid diagnostic test had 100% sensitivity and 92% specificity in both point-of-care and reference laboratory testing in this population (maximum cycle threshold 26·3). With two independent readers, the test detected all patients who were positive for Ebola virus by altona real-time RT-PCR; however, this benchmark itself had imperfect sensitivity. Background The ongoing Ebola epidemic in parts of west Africa largely overwhelmed health-care systems in 2014, making adequate care for malaria impossible and threatening the gains in malaria control achieved over the past decade. We quantified this additional indirect burden of Ebola virus disease. Methods We estimated the number of cases and deaths from malaria in Guinea, Liberia, and Sierra Leone from Demographic and Health Surveys data for malaria prevalence and coverage of malaria interventions before the Ebola outbreak. We then removed the effect of treatment and hospital care to estimate additional cases and deaths from malaria caused by reduced health-care capacity and potential disruption of delivery of insecticide-treated bednets. We modelled the potential effect of emergency mass drug administration in affected areas on malaria cases and health-care demand. Findings If malaria care ceased as a result of the Ebola epidemic, untreated cases of malaria would have increased by 45% (95% credible interval 43–49) in Guinea, 88% (83–93) in Sierra Leone, and 140% (135–147) in Liberia in 2014. This increase is equivalent to 3·5 million (95% credible interval 2·6 million to 4·9 million) additional untreated cases, with 10 900 (5700–21 400) additional malaria-attributable deaths. Mass drug administration and distribution of insecticide-treated bednets timed to coincide with the 2015 malaria transmission season could largely mitigate the effect of Ebola virus disease on malaria. Interpretation These findings suggest that untreated malaria cases as a result of reduced health-care capacity probably contributed substantially to the morbidity caused by the Ebola crisis. Mass drug administration can be an effective means to mitigate this burden and reduce the number of non-Ebola fever cases within health systems. Costs for breast screening are being driven higher by increased use of new imaging technologies such as digital mammography and MRI, workflows incorporating 2nd and 3rd remote-readings as quality control measure, use of computer-aided detection (CAD) applications and growth in aged population. The Cost of Breast Cancer Screening in the Medicare Population. Background Little is known about the cost to Medicare of breast cancer screening or whether regional-level screening expenditures are associated with cancer stage at diagnosis or treatment costs, particularly because newer breast cancer screening technologies, like digital mammography and computer-aided detection (CAD), have diffused into the care of older women. Methods Using the linked Surveillance, Epidemiology, and End Results–Medicare database, we identified 137 274 women ages 66 to 100 years who had not had breast cancer and assessed the cost to fee-for-service Medicare of breast cancer screening and workup during 2006 to 2007. For women who developed cancer, we calculated initial treatment cost. We then assessed screening-related cost at the Hospital Referral Region (HRR) level and evaluated the association between regional expenditures and workup test utilization, cancer incidence, and treatment costs. Results In the United States, the annual costs to fee-for-service Medicare for breast cancer screening-related procedures (comprising screening plus workup) and treatment expenditures were $1.08 billion and $1.36 billion, respectively. For women 75 years or older, annual screening-related expenditures exceeded $410 million. Age-standardized screening-related cost per beneficiary varied more than 2-fold across regions (from $42 to $107 per beneficiary); digital screening mammography and CAD accounted for 65% of the difference in screening-related cost between HRRs in the highest and lowest quartiles of cost. Women residing in HRRs with high screening costs were more likely to be diagnosed as having early-stage cancer (incidence rate ratio, 1.78 [95% CI, 1.40-2.26]). There was no significant difference in the cost of initial cancer treatment per beneficiary between the highest and lowest screening cost HRRs ($151 vs $115; P = .20). The study is mainly addressing the difference in costs between different regions of referrals. It would be interesting to explore the situation in the age group of 40 to 66 years old. Written by: Dr. Dror Nir, PhD. Operating Room Distractions & Surgical Errors Occur More Than 4,000 Times A Year In The U.S.
A study has found that young, less-experienced surgeons made major surgical mistakes almost half the time during a “simulated” gall bladder removal when they were distracted by noises, questions, conversation or other commotion in the operating room. In this analysis, eight out of 18, or 44 percent of surgical residents made serious errors, particularly when they were being tested in the afternoon. By comparison, only one surgeon made a mistake when there were no distractions. Exercises such as this in what scientists call “human factors engineering” show not just that humans are fallible – we already know that – but work to identify why they make mistakes, what approaches or systems can contribute to the errors, and hopefully find ways to improve performance. The analysis is especially important when the major mistake can be fatal. This study, published in Archives of Surgery, was done by researchers from Oregon State University and the Oregon Health and Science University, in the first collaboration between their respective industrial engineering and general surgery faculty. The findings do not necessarily apply to older surgeons, Feuerbacher said, and human factors research suggests that more experienced people can better perform tasks despite interruptions. But if surgery is similar to other fields of human performance, he said, older and more experienced surgeons are probably not immune to distractions and interruptions, especially under conditions of high workload or fatigue. Some of those issues will be analyzed in continued research, he said. This study was done with second-, third- and research-year surgical residents, who are still working to perfect their surgical skills. Months were spent observing real operating room conditions so that the nature of interruptions would be realistic, although in this study the distractions were a little more frequent than usually found. Based on these real-life scenarios, the researchers used a virtual reality simulator of a laparoscopic cholecystectomy – removing a gall bladder with minimally invasive instruments and techniques. It’s not easy, and takes significant skill and concentration. While the young surgeons, ages 27 to 35, were trying to perform this delicate task, a cell phone would ring, followed later by a metal tray clanging to the floor. Questions would be posed about problems developing with a previous surgical patient – a necessary conversation – and someone off to the side would decide this was a great time to talk about politics, a not-so-necessary, but fairly realistic distraction. When all this happened, the results weren’t good. Major errors, defined as things like damage to internal organs, ducts and arteries, some of which could lead to fatality, happened with regularity. Interrupting questions caused the most problems, followed by sidebar conversations. And for some reason, participants facing disruptions did much worse in the afternoons, even though conventional fatigue did not appear to be an issue. Events that should never occur in surgery (“never events“) happen at least 4,000 times a year in the U.S. according to research from Johns Hopkins University. The findings, published in Surgery, is the first of its kind to reveal the true extent of the prevalence of “never events” in hospitals through analysis of national malpractice claims. They observed that over 80,000 “never events” occurred between 1990 and 2010. They estimate that at least 39 times a week a surgeon leaves foreign objects inside their patients, which includes stuff like towels or sponges. In addition surgeons performing the wrong surgery or operating on the wrong body part occurs around 20 times a week. The researchers believe that this finding could help ensure that better systems are developed to prevent these “never events” which should never happen. The study examined data from the National Practitioner Data Bank which handles medical malpractice claims to calculate the total number of wrong-site-, wrong-patient and wrong-procedure surgeries. Over 20 years. they found more than 9,744 paid malpractice claims which cost over $1.3 billion. Of whom 6.6% died, while 32.9% were permanently injured and 59.2% were temporarily injured. Around 4,044 never events occur annually in the U.S., according to estimates made by the research team who analyzed the rates of malpractice claims due to adverse surgical events. Many safety procedures have been implemented in medical centers to avoid never events, such as timeouts in the operating rooms to check if surgical plans match what the patient wants. In addition to this, an effective way of avoiding surgeries that are performed on the wrong body part is using ink to mark the site of the surgery. In order to prevent human error, Makary notes that electronic bar codes should be implemented to count sponges, towels and other surgical instruments before and after surgery. It is a requirement that all hospitals report the number of judgments or claims to the NPDB. Makary did note, however, that these figures could be low because sometimes items left behind after surgery are never discovered. Most of these events occurred among patients in their late 40s, surgeons of the same age group accounted for more than one third of the cases. More than half (62%) of the surgeons responsible for never events were found to be involved in more than one incident. Makary comments the importance of reporting never events to the public. He stresses that by doing so, patients will have more information about where to go for surgery as well as putting pressure on hospitals to maintain their quality of care. Hospitals should report any never events to the Join Commission, however this is often overlooked and more enforcement is necessary.